With considerable fanfare and extensive advance publicity, Chinese opera singer Zhang Huoding made her American debut at Lincoln Center’s David H. Koch Theater. Performing with the National Academy of Chinese Theatre Arts, Zhang Huoding brought her own very modern magnetic star power and the very old, formal traditions of a highly stylized traditional Chinese art form to an exuberantly adoring, largely Chinese audience. Over two nights, the company presented Legend of the White Snake and The Jewelry Purse. On both evenings, the house was packed; about a quarter of the audience came to both evenings. The atmosphere of excitement about The Jewelry Purse on the second evening was fueled in part by the audience delight with the first evening. The Jewelry Purse, a well-loved masterpiece of Peking Opera and one of Zhang Huoding’s signature roles, is at its core a simple tale. Wealthy bride Xue Xiangling, on her way to her wedding, hears the lament of a poor, doweryless bride and spontaneously, anonymously gives her an embroidered pouch containing some of her own precious jewels; years later, when Xue, separated from her husband and child by a violent flood, is destitute, hungry and grieving, she finds her way to the wealthy Lu household where she finds work as a maid and play-companion for the Lu child. When playing with her young charge, Xue finds the jewelry purse that had been her own, and her mistress, the now wealthy Madame Lu recognizes that the maid was in fact her own wedding-day benefactress. Madame Lu now receives Xue, her maid, as an honored guest who will become her sister. Xue’s family is restored to her, happiness abounds and the original act of kindness is multiply rewarded. Written by Weng Ouhong and first performed in 1940, The Jewelry Purse, though a mid-twentieth century work, draws on hundreds of years of Peking Opera tradition, with roles for males and females, equal measures of drama, tragedy and comedy, and a performance vocabulary that combines singing, speaking, dancing, pantomime and even acrobatics. The main publicity thrust of this performance as well as its companion piece, Legend of the White Snake, presented the night before, was centered on the American debut of Zhang Huoding, but this was in fact a massive collaborative project overseen by the China Arts and Entertainment Group. The National Academy of Chinese Theatre Arts offered its best stars, students, musicians, directors, designers, craftspeople and artisans for this lush and lavish, breathtakingly beautiful production. The collaboration of performers and musicians on the one hand and set designers, costumiers, makeup artists and props personnel on the other resulted in an evening of song and dialogue, dance, drama and comedy in a setting of jewel-like magnificence. The sets and costumes featured brilliant blues, reds, pinks, reds, greens, yellows and golds on shimmery, constantly moving textiles; embroideries – on garments and canopies, furniture, costumes and, of course, the jewelry purse itself – were both delicate and bold. 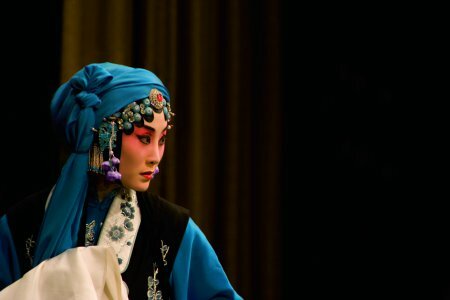 The core features of Peking Opera – the highly stylized and symbolic movements, the narrative economy, the very tight demands of certain song types – are fixed and traditional; they are, by definition, conservative. But within the very strictures of the form, even as it has become clichéd in Western depictions and its comic elements susceptible of reduction to buffoonery, there is a disciplined spareness that, at its best, transcends tradition and presents scenes of uncluttered human clarity that are both modern and timeless. This astonishing quality of distilled human essence – of joy or grief, longing or hope or contentment reduced to its quintessence – is what Zhang Huoding and her most accomplished colleagues embody. Two elements separated Zhang Huoding from her fellow performers in The Jewelry Purse, ensuring her international star status. First, her character, Xue, almost singularly experiences an actual transformation of being in the course of the story: she begins the story as a spoiled, self-centered rich girl and becomes, by its end, a fully realized, emotionally generous woman who understands that the possession of richness does not depend on wealth. Unlike other characters whose arias explain themselves to the audience or actually advance the plot, Xue’s arias are genuine soliloquies: Xue is witness to her own responses to her world and to her own changing self. Second, Zhang Huoding’s voice, unlike those of the other women in the company, has a richly earthy quality to it, something approximating a mezzo-soprano voice in Western terms. And, equally important, though conforming absolutely to the disciplined form of her genre, she holds nothing back: she is unabashed in her determination to be a vehicle of revelation. Though Zhang Huoding’s megastar status and the China Arts and Entertainment Group’s well-resourced commitment to share Chinese culture with the world ensured that the Lincoln Center extravaganza was a hit, there were some artistic lapses. The miking of the singers – especially the women – exacerbated the whiny nasality of the singing style. Comic interludes tended to be leaden rather than light. A few jokes, rendered frequently and without variation – for instance, the constant debate of a father-son pair of hangers-on about which was the greater snob – dragged. A more subtle problem emerged: in its essence, Peking Opera has an element of intimacy to it that twenty-first century international glitz threatens. The same global connectedness that permits effective cultural exchanges erodes distinctive regionalisms. It is a tricky matter. 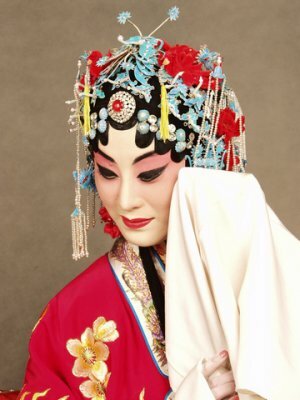 No matter how fervent the commitment that Zhang Huoding and her colleagues on the faculty of the National Academy of Chinese Theatre Arts make to the preservation of Peking Opera, the transport of individual operas away from their original home contributes towards the loss of their essence. 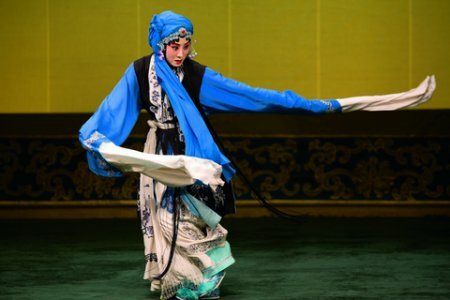 The New York City Lincoln Center audience can only be grateful for Zhang Huoding’s brief presence, but the world as whole can rest easy that the Peking Opera was, in 2010, accorded a place on the UNESCO Intangible Cultural Heritage of Humanity List. In addition to Zhang Huoding’s marvelous performance, individual artists in The Jewelry Purse provided particular moments of charm and beauty. Whenever Jin Lishui (Grandma Hu) was on stage, her consummate artistry reigned: she imbued her stock salt-of-the-earth old woman character with a genuinely warm and deeply complex wisdom that moved much deeper than the language of the libretto. When Grandma Hu found Xue after the flood, gestures and connections between the two women were both elegantly choreographed and achingly human. The band of nine musicians was superb, alternately setting the context for the singers’ movements and songs and following the characters’ unfolding stories. The stage director was Zhang Huoqian and Li Wencai was responsible for the art director. At the conclusion of the two hour and 50 minute continuous performance, the audience went quite wild: shouting and clapping, they filled the aisles, surging towards the stage. The orchestra level was thick with noisy humanity, all holding cell phones and smart phones high as they demanded an encore. After some ten minutes of raucous hullabaloo, Zang Huoding obliged, and was then received again with raucous adulation. The Jewelry Purse was a dazzling evening. It wasn’t perfect, but it was quite wonderful. No doubt, New York’s Chinese and non-Chinese audiences alike have reason to hope that Zhang Huoding and the National Academy of Chinese Theatre Arts will soon return. A Chinese spectacle with a beating heart at its core.